I have just finished my first week at the School of Rock on board the research vessel JOIDES Resolution. My fellow "Rockers" and I have just four more days on the ship before we are back in port in Victoria, British Columbia. Then we head our separate ways to share our experiences with those back home. The educators participating in the School of Rock have diverse workplaces and audiences, yet we are all developing projects to communicate what we have learned on the JR from the scientists (and from each other). These projects will be shared with students, colleagues and other educators around the country. The theme of "science careers" is emerging in many of the projects being developed. As educators, we are still trying to expose students to the numerous career options available in the field of science. On this ship alone, there are scientists with expertise in chemistry and geochemistry, geophysics, paleontology, sedimentology and paleomagnetism–who all collaborate since they concentrate on different areas of oceanography. Beyond the scientists, the ship requires laboratory technicians with many of the same specialties to assist the scientists, as well as drilling engineers and coring technicians. When discussing how we can best demonstrate these disciplines and careers to students, the first thought that comes to mind is using media. 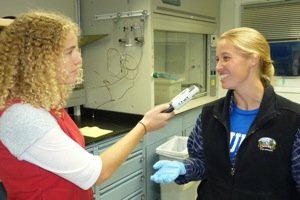 By recording the scientists as they talk about their work, we can hear the passion they have for what they do. We can see the animation on their faces as they discuss how what they do makes a difference to society. And we can show students that scientists are real people, with diverse backgrounds, who all took a different path to get where they are today. Let the interviews begin.